Nem Lui are genius. Succulent pork molded around lemongrass sticks create a Vietnamese infusion that are ideal for dipping in the sweet, hot sauce. Trust us when we say that the Hue sauce is well worth the time to make. It really is like nothing else and is a truely local taste of Hue in Vietnam. The good news is that it can be frozen and is also served with Banh Khoai Hue. So why not try both and use this deliciously unique sauce? Mix the beef, minced pork, pork skin, pork fat, garlic, shallots, sugar, pepper and fish sauce. Knead for 5 minutes until all ingredients have combined well. Cover and refrigerate for 1 hour to over night for the flavours to marinate the pork. Divide the nem lui mixture into 12 portions. 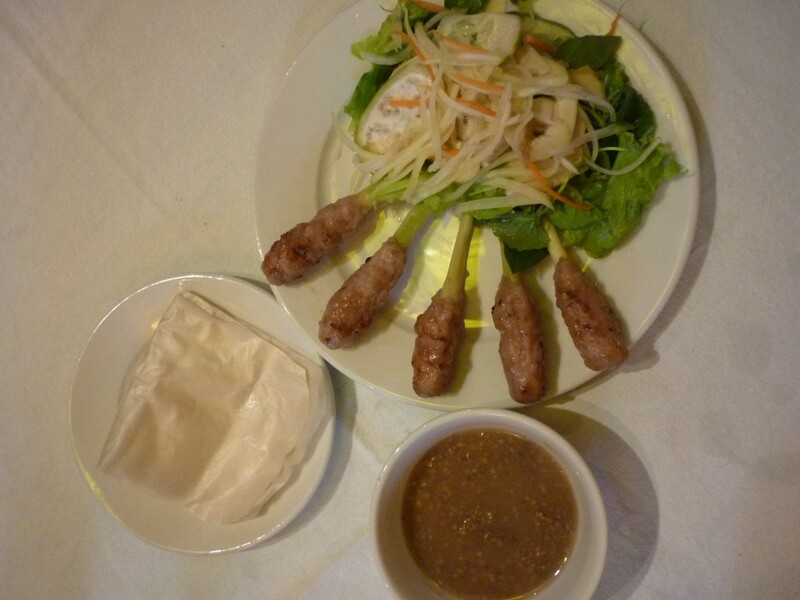 Firmly roll each portion into a sausage shape around each lemongrass stick and brush with a little oil. Heat a barbecue grill or char-grill pan and cook the Nem Lui skewers for 6 minutes, turning every few minutes, until cooked and slightly charred. Serve with a watercress and dried coleslaw with rice pancakes so people can build their own rolls to dip into the sauce.